Pharmacists are able to do and provide so much more than you may think! They can be an essential part of your healthcare team. If you do not have a pharmacist, you can depend on we are sharing with you our reasons why you should consider having a personal pharmacist. We are in the business of healthcare, which means that dispensing medication is not the only solution to better health. We want to provide a complete healthcare experience in our pharmacy, which means we offer a wide range of products and extra services to help you achieve balanced health. Your personal pharmacist knows your medical history, as well as all types of prescription and non-prescription medication you may take. They are able to assess all the factors related to your overall health and provide suggestions and recommendations that are right for you. Our Pharmacists have acquired their Additional Prescribing Authority through the Alberta College of Pharmacists, allowing them to prescribe new medications, adjust doses of medications and extended refills when needed. This makes it easier to get the medication you need. Pharmacists take the time to explain complex prescriptions and how they interact. They answer all questions on your medications, how to use them, and how they work. They work every day to ensure you and your family have access to the best products and services you need to live a full and healthy life. Your personal pharmacist holds your health close to heart. It’s what they do every single day. 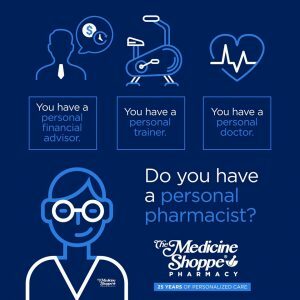 For more information about our Personal Pharmacists and the services we offer check out our website, stop in-store, or give us a call at 403.455.9939.